The Simtec USB stack may be found in the Simtec USB podule, the Stuart Tyrrell Developments UNIPod and the A9Home computer from Advantage6. As standard it provides USB keyboard and mouse drivers and a Mass Storage driver for USB flash and hard drives. Note: the information on this page has mostly been established through unofficial channels and experimentation, and has a high chance of being wrong. It is not supported by Simtec or STD and may be subject to change in future versions of the USB firmware. The Simtec USB stack and HID drivers are poorly documented. The mouse drivers don't use the RISC OS 3.5+ mouse driver interface. This means they work in parallel with the configured mouse: a USB mouse and a quadrature mouse can work at the same time. It is suspected it inserts mouse events into PointerV instead. The scrollwheel is supported on RISC OS Adjust, using the WindowScroll module to move windows; on Adjust OS_Pointer provides an interface to read scrollwheel events (see Adjust documentation or StrongHelp OS manual). This information relates to MassFS 1.00 as supplied with Simtec USB cards and Unipods. MassFS supports only USB Mass Storage devices with class:subclass:protocol of 08:06:50, that is, "Mass Storage:SCSI transparent command set:Bulk-only transport". This group includes most pen drives. It doesn't support devices that use the ATAPI subclass. Apart from GetDriveCount, some other MassFS_ SWIs use the drive name as parameter in r0. Don't try to format the disc larger than the size it actually is: it might be worth stepping down a megabyte or two from the published size, and beware that some devices are measured in sizes of million bytes (i.e. 32MB is 32,000,000 bytes rather than 32*1024*1024 bytes). This may need a slightly tweaked formatter to work on RISC OS 4.0 rather than 4.3x. Reads 512 bytes from the disc starting at offset &4000. Writing is believed to work in the same way. This looks like a SCSI START/STOP UNIT command. It might be possible to send other SCSI commands to MassFS devices in a similar way. MassFS versions near 2 (such as 1.98) are supplied with the A9home. It is extended with a FileCore interface which enables it to support FileCore formatted discs (ie E or E+ format). This also allows it to support drives over 2GB in FileCore format only. FileCore support is implemented with a second filing system, MassFC, which supports two FileCore formatted discs at any one time. If a device is flagged as being FileCore formatted, MassFSFiler will check if it is and if so open MassFC::<name>.$ and if not open it as FAT16 format with MassFS::<name>.$ There remains one module MassFS that calls OS_FSControl to create the MassFS filing system and FileCore_Create to create the MassFC filing system. MassFS 2 provides the MassFS_SectorOp command for raw access to a disc, but only after it's been detected as FileCore format. Other Filecore-based SWIs (DescribeDisc, Drives etc) aren't provided (if you want this information you'll have to use MassFS' other SWIs). FFFFF: alphanumeric codes describing flag settings for this device. 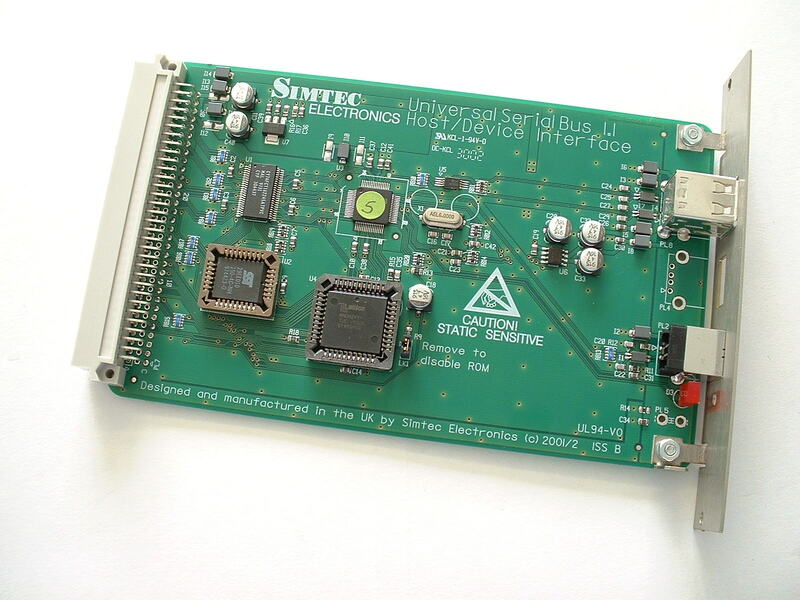 Both Simtec USB podule and Unipod use a NXP/Philips ISP1161 controller. The ISP1161 has four 16-bit registers, two for the host controller interface and two for the device controller interface. Both work on a command basis - a 16-bit command is written to the command register, then one or more 16 bit words are read from or written to the data register. The top bit of the command byte indicates whether it is a read or write operation. (and then cut out the bottom 16 bits of each word), which on some hardware is quicker than doing lots of LDRs. This is just an example - the accesses need to be in supervisor mode so you can't make them from BASIC. Don't forget, if you are writing to the IOC space addresses, the 16 bits of data need to be in bits 16-31 of the 32 bit word you write. The same works on the device controller, only the command DcChipId is &B5. The ISP1161 provides two interrupt lines - INT1 for the host controller and INT2 for the device controller. The podule bus has one shared line, so it is most likely the CPLD provides two or three bits of interrupt status and control. There are two pairs of DMA pins, one pair for each of host/device. These are wired to the CPLD and the CPLD drives the DMA pins on the podule bus (it's not clear whether Simtec's driver actually uses these). So there may also be another two or three bits of DMA control. The interrupt status register is the bitwise AND of the mask register and the interrupt bits in the information register (which come directly from the USB controller). If bit 0 of the status register is 1, the device is currently asserting the podule interrupt line. The interrupt service routine can use bits 5 and 6 to work out which device is causing the interrupt. Turn off podule interrupts in the IOMD (otherwise we'll crash - but stops any other podules working). Read IOMD's podule interrupt status bit to check there are no pending interrupts from elsewhere (removing other podules is a good idea, or else pull out network cables). Flip the InterruptOutputPolarity bit in the HcHardwareConfiguration register and write back to the host controller. Lo and behold, we're causing an interrupt! Check we are really causing an interrupt, by looking at the podule interrupt status bit in IOMD. Put the InterruptOutputPolarity bit back to normal.